SUMMARY: Healthcare companies have grown increasingly creative in their use of economic and benefits-based incentives to drive engagement and participation in health and wellness programs. We wanted to see which benefit-based health and wellness incentives are offered most frequently by healthcare organizations for program participation. 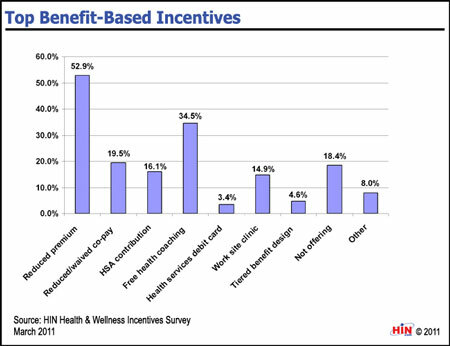 The third annual Health and Wellness Incentives Use e-survey by the Healthcare Intelligence Network found that there's been significant shifts in the adoption, promotion and evaluation of financial- and benefits-based incentives programs  as well as some novel ways incentives are utilized across the healthcare continuum in 2011. Download the executive summary of Benchmarks in Health & Wellness Incentives, 2011 Edition: Data to Drive Health Promotion, Compliance and ROI. Benchmarks in Health & Wellness Incentives, 2011 Edition: Data to Drive Health Promotion, Compliance and ROI provides actionable information from 156 healthcare organizations on the use of incentives to promote health behavior change. This essential resource has been compiled from an analysis of responses to HIN's third annual survey on the use of health & wellness incentives, administered in March 2011. Benchmarks in Health & Wellness Incentives, 2011 Edition: Data to Drive Health Promotion, Compliance and ROI is available from the Healthcare Intelligence Network for $127 by visiting our Online Bookstore or by calling toll-free (888) 446-3530.